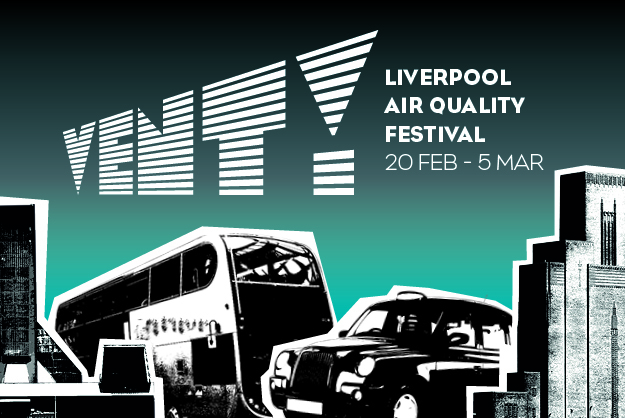 Liverpool Air Quality Festival launches on Saturday 20 February, with a fortnight programme of free artistic interventions and public forums to raise awareness of Liverpool’s air quality, which organisers describe as ‘an invisible public health emergency’. Arts festival to shine light on Liverpool’s poor air quality – an ‘invisible public health emergency’. VENT! Liverpool Air Quality Festival launches on Saturday 20 February, with a fortnight programme of free artistic interventions and public forums to raise awareness of Liverpool’s air quality, which organisers describe as ‘an invisible public health emergency’. Five Liverpool-based artists – Julieann O’Malley, Tristan Brady-Jacobs, Pamela Sullivan, Tomo and Charlotte Weatherstone, have been commissioned to deliver new cultural products or public art works that engage with the public about air quality. Each new work responds to the issue, its causes, the impact of long-term exposure to microscopic man-made pollution and the solutions that are in our hands. The artists were each paired with one of a core team of scientists to develop their new art work, including Andy Morse, Professor of Climate Impacts at the University of Liverpool. Andy said ‘Liverpool is not as polluted as either London or Paris, but it remains one of the poorest cities in Europe, and deprivation brings with it a number of health challenges. Liverpool has very high rates of lung cancer and coronary heart disease, and air pollution is a known risk factor in both of these illnesses. The festival is the culmination of the Liverpool Air Project, which has been initiated and managed by Engage Liverpool CIC, a social enterprise that runs projects that make a positive contribution to the liveability of the City Centre and Waterfront. Gerry Proctor of Engage Liverpool said ‘Poor air quality in Liverpool is not receiving the profile it deserves as it is a serious public health issue that other cities are facing up to. We want to reach as many people as possible so that we all achieve a level of awareness that leads to positive change in how we live and also how we organise our city. It is wonderful that artists and scientists have worked together to bring the VENT! Arts Festival to the city’. 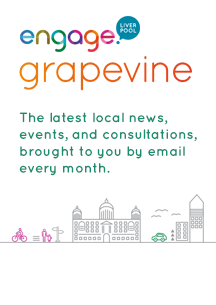 Various venues – See individual listings for details. A fortnight programme of free public forums and artistic interventions to raise awareness of Liverpool’s air quality – an invisible public health emergency. Occlusion is a durational performance installation, incorporating video work, soundscapes and photography that provokes questions and conversation about the real effects of the ‘invisible intruder’ – microscopic man-made pollution. Audiences will see O’Malley test the limits of her body as she cycles through a cloud of air pollution made visible. A panel of participating artists, scientist and academics discuss the public health emergency that is air quality in Liverpool. 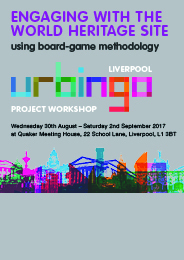 Speakers will present the research undertaken as part the Liverpool Air Project and will discuss the art works that have been produced in response to that research. Followed by Q & A. Please find the panel participants below. Iris is a living breathing installation, a visual promotion of green inner city spaces. Living in the Baltic Triangle Iris, an air spirit, watches over Liverpool. Breathing fresh air her swirling hair is living moss and lichens, she offers her opinion on alternative modes of transport to keep the air quality pure, the buildings clean and people of her city healthy. She also offers a home to wildlife and brightens up an old building with her wildflowers. Mosses and lichens are ideal for monitoring trends in the deposition of pollutants over time and across difference places, as they are sensitive to increased levels of nitrogen and will notably deteriorate if air quality is poor. A pop-up installation – the artist presents ‘what might have been’, reflecting on his scheme to customise a small number of Liverpool City Bikes. Look out for Pamela’s cocooned skeletons around the exits to the Mersey Tunnel, Liver Buildings, Albert Dock, The Royal Hospital, Commutation Row, Jamaica Street, Berry Street and St Luke’s Church. Pamela will also be demonstrating the erosion process at Bluecoat. Find the Liverpool Glorms. paste ups of portraits of ordinary folk made monstrous by their desire to obtain immortality, on the walls and surfaces of the city. The portraits will appear in the areas of greatest pollution around the city centre. Julieann O’Malley is an interdisciplinary artist based in Liverpool. Her practice both for galleries and public space is fundamentally live durational performance installations, video work, sound and photography. O’Malley likes to test the limits of her body during durational performances. She condenses ideas and uses semiotics as a communication method. O’Malley finds ways to explore, engage and have open discourse and dialogues about the ever changing environments and practices of society. Charlotte is a graffiti artist, designer and illustrator whose work encompasses many scales and media. She works on canvas, paper, computer and brick walls and her influences include nature, calligraphy astronomy, ballet, and Art Nouveau. In addition to pursuing her own art, she also runs community engagement workshops, using art to help people think about their environment. Pamela is currently Artist in Residence at the Williamson Gallery & Museum, Birkenhead, although she tends to exhibit away from the white spaces found in galleries. She creates site specific work and has worked in ruined churches, underground tunnels, derelict buildings and hidden spaces in and around the urban landscape. Pamela works in both 2D and 3D formats using materials such as wood, cardboard and ceramics to make playful work that the viewer is able to walk through and interact with. Tristan is a community artist, photographer, video maker, street artist, performer, designer and arts manager, with a background in the inclusionary sector (working with hard to reach groups such as gangs in Liverpool and devising intercultural workshops and inclusion programmes for The Lowry, Tate, and Everyman & Playhouse, Liverpool). He has worked in theatre (for Welfare State, IOU, Magic Ox and Rathbone Theatre Workshop) and presented the first digital art exhibition in Liverpool (Hyperarts 92). He has devised and managed many new art programmes and events including Markit, WARPLiverpool and HOBOBazaar. The City Council have declined permission for an art-work to be placed on a small number of City Bikes raising the profile of poor air quality on the roads. This is a great shame and a real surprise to all the artists and Engage. There will be a pop-up response in the Baltic Triangle on Thu 3 March. Tomo works in fine art and graffiti using discarded materials and working with an ethic of recycling. Born and brought up on Merseyside, Tomo has participated in many groups shows, including the Liverpool Biennial 2014 (as part of The Old Blind School exhibition) and Mark It Street art festival (2014) and Lost Properties At The Kolbhalle, Kolbhalle Artist Community, Germany (2013). His solo shows include Spectrum at the Wolstenholme Creative Space (Liverpool Art Month, 2012) and the Liverpool Art Prize at Metal, Liverpool (2012), for which he was awarded the Liverpool Art Prize Peoples Choice award. He is currently also a film projectionist for Tea & Two Slice (Liverpool). Watch the Vent! Festival video now.